Iris Apfel is a visionary. A 93 year old with a sense of style that transcends fashion and makes her an artist of sorts, a curator and a stylist, a hoarder maybe, but with undeniable personal taste. What makes Iris so admirable is how she remains grounded and unpretentious, even whilst possessing such high status as an icon in the industry. This is clear when we see Iris at high-end retailer Bergdorfs as she potters into a room full of mannequins and dresses and them as she would herself. Accessorising with several layers of bracelets and bangles, adorned with necklaces upon necklaces like some psychedelic Mr. T. Effortlessly she imparts distinctive style. Standing by, watching intently, the Bergdorf’s bodies lend their own verbage to capture Iris’ work. They might as well be looking at them with a tilted head and hand on chin as they describe her process as sculptural, admiring the rhythm. Marvel films are lost on me. During fight scenes or action sequences I tend to glaze over and lose interest. I couldn’t watch the first Avengers film because after 10 minutes I didn’t care about anyone or anything on screen. Other than Tony Stark’s Robert Downey Jr. delivery I don’t get the humour. Thor I found cringeworthy, and the rest that I saw took themselves way too seriously. I can’t buy into it. I can’t get into that style of acting – that hammy, cheesy croque monsieur of self importance that can inject gravitas into a glance. That was until Guardians of the Galaxy. Taking an obscure Marvel comic with an absurd premise, attaching a director who had shown his comedic sensibilities and awareness of the superhero tropes in The Specials, and creating something much more subversive. A Marvel film that was self-aware, self-deprecating and funny. This is what lead me to see Ant-Man. I knew nothing other than Edgar Wright and Joe Cornish had been involved and that it was about an ant-sized superhero. It sounded absurd, surreal and like it would be impossible for it to take itself too seriously. Alas, nothing is impossible in superhero movies. Whilst the film tried for comedy it felt like it was the ideas, the concepts themselves, that were funny – and so I never really laughed out loud (a couple of exceptions in Michael Pina). The first time Rudd shrinks down to size he is thrown through a series of obvious trials like something out of the Magic Schoolbus or Micro Machines – a bath-tub! a hoover! I didn’t believe Paul Rudd for a minute. Not as a hacker nor a nimble-ninja cat-burglar. Not a superhero or even a father. Perhaps I’m looking in the wrong place for believability but I was never involved in the film. What I found really jarring was the whiplash from utter silliness to sober melodrama which I think is symptomatic of this type of film. Where Guardians parodied the Marvel format, abiding the rules but taking the piss at the same time, Ant-Man just slots right back into it with endless reams of exposition, the obligatory montage sequence, and a heavy dose of melodrama. It felt painted by numbers and I didn’t care about what picture was being created. It’s funny that the stakes of the film are so much lower than the Avengers films (not funny ha-ha) but to me it just captured the problem that I have with Marvel films – I don’t care about anyone in this world. It feels silly. The fight scene between two micro-sized men on a Thomas the Tank Engine track was funny because it acknowledged the format, how Marvel are reliant on scale as a spectacle, on illusory effects. I know that I am in the minority for not accepting this film as a bit of fun, but it just wasn’t fun for me. It was boring and lifeless. The concept of going sub-atomic was great and so too were the effects used to capture the microscopic landscapes, but it just wasn’t strange enough. It was just another Marvel film. And Marvel films are lost on me. I’m sorry. 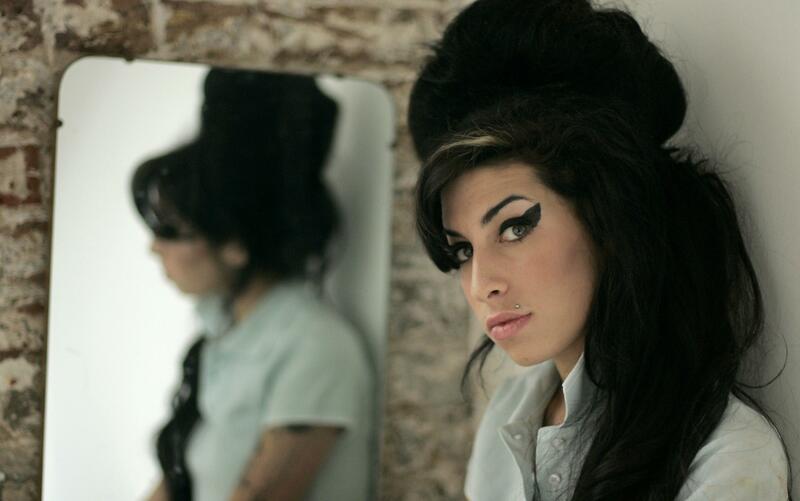 In the lobby after a sold out preview of  Amy  I was met by a wave of young girls with smeared mascara, not in homage to the feline-Egyptian style of Winehouse, but thick black tear tracks. Luckily I don’t tend to wear make-up in public as this was an emotional and affecting film. Filmmaker Asif Kapadia remains invisible for the most part, stitching together archive footage from the shaky home videos and mobile phones of Amy’s humble beginning, to paparazzi footage and televised interviews in her later resented stardom – ironically the picture gains stability as Amy loses it. Over laying these images are audio interviews with those close to the north London jewish-jazz singer in place of the usual talking heads. This gives the film a more natural feel and keeps Kapadia from becoming a subject himself, appearing instead as a collection of artifacts – a scrapbook complete with the thoughts of friends and family. The result is something more human. The first half of the film tracks Winehouse’s musical inspiration, taking a jazz influence from her father along with a dose of heartbreak when he left the family after a lengthy affair. The following years track her incredible song writing as she captures moments of her life with poetic lyricism that, like her, are both unpretentious and funny, often revolving around the men in her life – forever seeking a father surrogate. Amy is real, saying that she couldn’t write what she didn’t know and so her music became a way of expressing emotion and dealing with darker realities in her life. I have long been a fan of debut album Frank but it was only in this context that familiar songs would play with new meaning. Each song is presented from a live recording, either on stage or in studio, lending a more raw expressive quality. The lyrics are shown on screen too, emphasising their place within Amy’s story. What is so sad about the film is that her successes are ultimately framed by her death of alcohol abuse in 2011. With Winehouse garnering most attention from the media in these later stages, exacerbating the existing problems, there is only so much of her life documented beforehand, or on her terms. The Amy that invites the camera is effortlessly charming and funny – greeting her friend at the door in character as the houseboy, or appearing humble and endearing in an interview with Jonathan Ross. This is the second documentary of recent to focus on one of the 27 club – that group of prodigal talents who died at this early age due to excess of somekind – the other being the Kurt Cobain doc Montage of Heck. Besides their struggles with addiction and inability to deal with fame, there are many striking similarities between their lives and the films themselves. Both productions began with the permission of family and access to masses of archive footage, until a story began to form that showed them in a negative light, as the potential cause – and so both Courtney Love and Mitch Winehouse respectively withdrew their support and rallied against the films. Where Kurt Cobain found himself unable to cope with the pressures of fame and so committed fully to a destructive relationship with Love and heroin, Winehouse had her on-again-off-again Blake Lively – the man to introduce her to crack cocaine and heroin. All the while her father booked her on tours, arranged a camera crew to invade her private holiday and as famously captured in the hook of her hit song advised against rehab. There are parallel scenes using archive material from near the end of their lives that polarised the audiences I was in. When a doped-up, scaggy Cobain sits with an equally messy Love and their baby daughter Francis Bean – he makes passing jokes about rival Axel Rose. Cobain’s sudden turn to matters more trivial within the context is comical but as the audience you feel the grimy reality of the situation and how it will inevitably play out. Similarly when an up-until-now abstaining Winehouse phones her personal security and leaves a slurring message about her sudden creative surge in writing Wu-tang style battle-raps, her humorous charm comes through, even when under the influence, but we all know where this is heading. This is what makes both films so tragic – we are fully aware of their eventual demise and so each moment of excess, each lyric pointing to the fact, becomes an ignored warning sign, a foreboding tale of their fate which makes the jokes turn sour. Amy Winehouse was an amazing talent lost to a frenzy of fame that infected those closest to her and stopped her from ever getting help when she needed it. The documentary is important in relaying this message – holding a mirror up to the predatory nature of the media even if it is guilty of the self-same exploitation. Bad City, a comic book mesh of Iran and the US – like the film’s writer/director Ana Lily Amirpour – where pimps, whores and drug addicts fill the street at night, watched over by a lone girl in the shadows: a vampire in a veil. The genre is given new cultural significance in this middle-eastern setting despite being shot in the Californian desert. The chador becomes a cape. The meek silence of an impassive woman becomes more an ominous threat. The Girl isn’t lead around by men, she stalks them. The vampire becomes an icon of female empowerment and violent revenge as the seemingly vulnerable girl walking home alone at night is actually the predator here. Yet still, after punishing a lowlife pimp who closely resembles Ninja from Die Antwoord, this moral avenger knows she has done wrong. She is bad. Sinful even. Shot in black and white, spoken in Farsi, and with a sleek soundtrack comprised of indie, punk, traditional Iranian music and tinges of Ennio Morricone, the film is aware of how cool it is, or at least how cool it wants to be – take for instance our vampire’s penchant for skateboarding, or our James Dean modelled hero Arash. The confidence of the film, reinforced by often beautiful composition, does allow certain scenes to unfold slowly and with greater impact. One truly beautiful scene sees Arash in The Girl’s room, dressed up as Dracula, very gradually approaching her back. A spinning disco-ball throws fractured light around the room, adorned with slightly off iconic music posters (think: Ghana’s bootleg movie posters), as the distance between them is closed so very slowly, lasting almost an entire song. Unfortunately these slower, more deliberate scenes are dropped in favour of typical genre conventions, steering into something much more predictable with less flair and originality. There isn’t much to the story itself, and some crucial moments and character decision’s really don’t add up. Overall the film does feel a little style over substance, but it sure is a sleek style worth paying attention to. At times. Tove Jansson’s classic comic strip has found its way to the big screen after 60 years, with the Moomins setting sail for the south of France in search of adventure and a taste of the high-life. 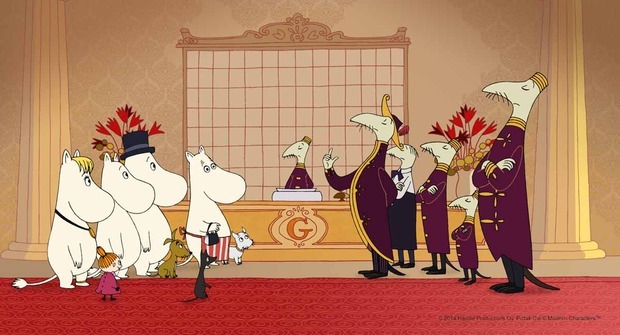 Snorkmaiden, taken by the allure of champagne on the beach, leads Moomin (a cingeworthy Russel Tovey), and his family, as they set out in a humble sail boat across stormy seas to find themselves like fish out of water among the glitz and glamour of the Riviera. The traditional hand-drawn animation gives the film a beautiful composition that can at times blossom into glorious surrealism – roughly sketched storm clouds shed long streams of raindrops over a golden sea as the well-meaning Moomins find themselves in trouble once again. Where most films aimed at children these days have an edge to them, layered with jokes for the parents or breaking from the story with a wink-nudge, Moomins on the Riviera carries charm in its sincerity (although there is one brilliantly absurd moment when a character falls in love and has to get his cousin to take his place in the story whilst he gets married.) Where 2D cartoons like SpongeBob SquarePants and puppets like the Thunderbirds have been converted into CGI its impressive how Moomins holds onto its very essence in both values and visual style. Throughout their ordeal of being mistaken for eccentric royalty and running up bills that they can’t pay, the Moomin family maintain their naïve sense of wonder and innocence. Though they can be swallowed by insecurities and anxiety, they are for the most part delightfully free of self-awareness. This works in complete contrast to the snooty jet-sets of the south of France where the sharp faced locals are interested only in status and celebrity. “We simply don’t fit in here” comments MoominMama, noticing the gap between their way of life and that of local star Audrey Glamor. Moomins on the Riviera meanders for the most part but it is certainly a heart-felt children’s film that, like the family leading the adventure, isn’t trying to be something it isn’t and embraces its character. I hadn’t seen a single episode of popular English spy-drama Spooks before watching the new film – and it looks like it’ll stay that way. It had been described to me as less clean-cut and more toned down than its American counterparts but had started to grow more farfetched over its seven series stretch. Spooks: The Greater Good opens to a London skyline behind a curtain of rain and queues of traffic stretching to the horizon – this seems realistic enough – but not the most desirable situation for the MI5 agents at the centre of this hold-up, guarding Adem Qasim (Elyes Gabel) a terrorist in transit. Something is wrong. Soon Qasim will make his escape and heads will roll. Held responsible for this debacle, Spooks stalwart and Head of Counter Terrorism Harry Pearce (Peter Firth) is forced to resign and disappears soon after. 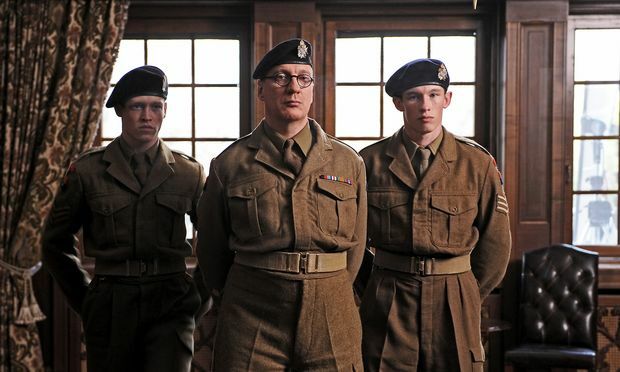 With the organisation now under threat – they look to a fresh face to find Harry and the truth behind his disappearance. 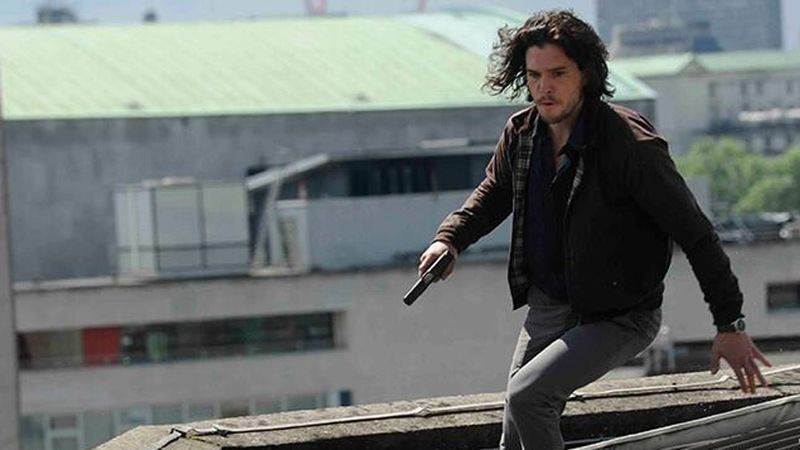 Kit Harrington has traded Longclaw sword for government issued pistol as Holloway – the sharp, fast-thinking ex-MI5 agent who believes Harry is still alive. Speaking mostly in a gruff whisper, in need of a Strepsil, he’s most impressive when in action, and luckily for us he rarely stops for breath. 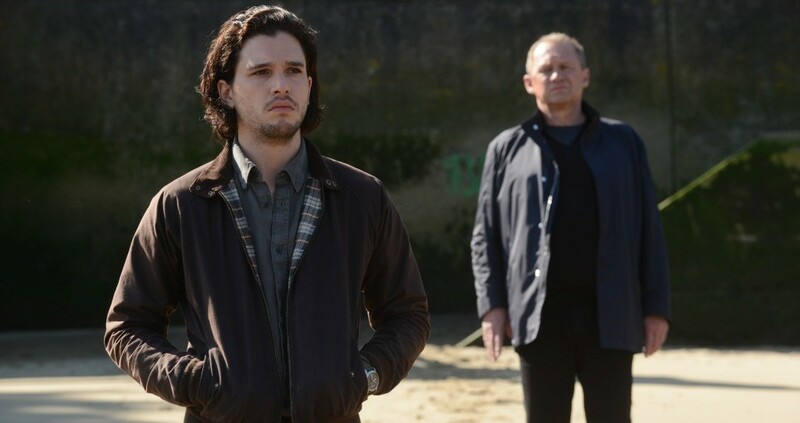 Spooks: The Greater Good certainly has its impressive set-pieces including Qasim’s breakout and a final shootout, both making the most of their locations. But in-between these bookended sequences there is barely anything other than hammy exposition-laden dialogue: suspicions running high, and characters just running. In these instances the locations become a distracting backdrop. When the film isn’t darting to Berlin and Moscow with sweeping aerials, it’s hopping about through postcard London skylines. Amidst all the toing and froing there’s everything you’d expect from a twisting espionage, filled with double crosses and conversations at the barrel of a gun. Surprisingly though, most of the film revolves around paranoia among the bods back home at ‘The Grid’ and as such the action scenes give way to TV melodrama. Qasim seems a more complex and rational villain, but he is talked about more than he is seen. When the action sequences are in full swing the film is gripping but caught up in whom to trust, the film loses sight of the threat and the tension suffers for it.